There are many galaxies in the Universe and although there is plenty of room, they tend to stick together. The Milky Way, for example, is part of a large gathering of over fifty galaxies known as the Local Group. 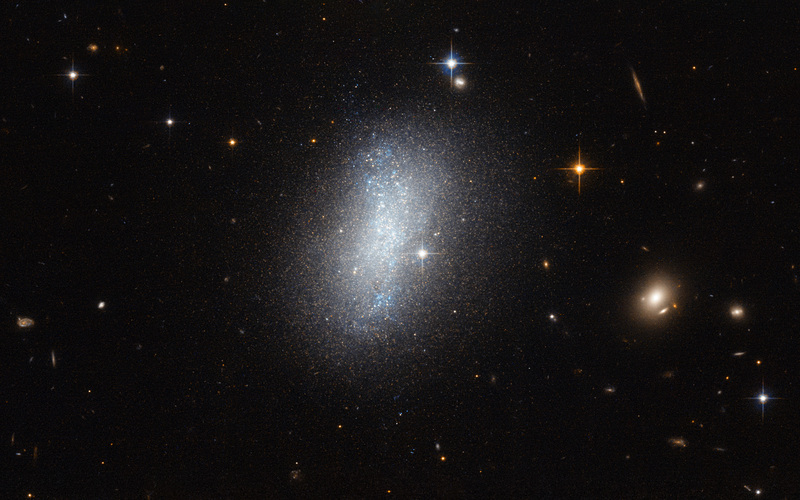 Galaxy groups like this come together to form even larger groups called clusters which can congregate further still to create mammoth superclusters. The sphere of space surrounding our galaxy is known as the Local Volume, a region some 35 million light-years in diameter and home to several hundred known galaxies. 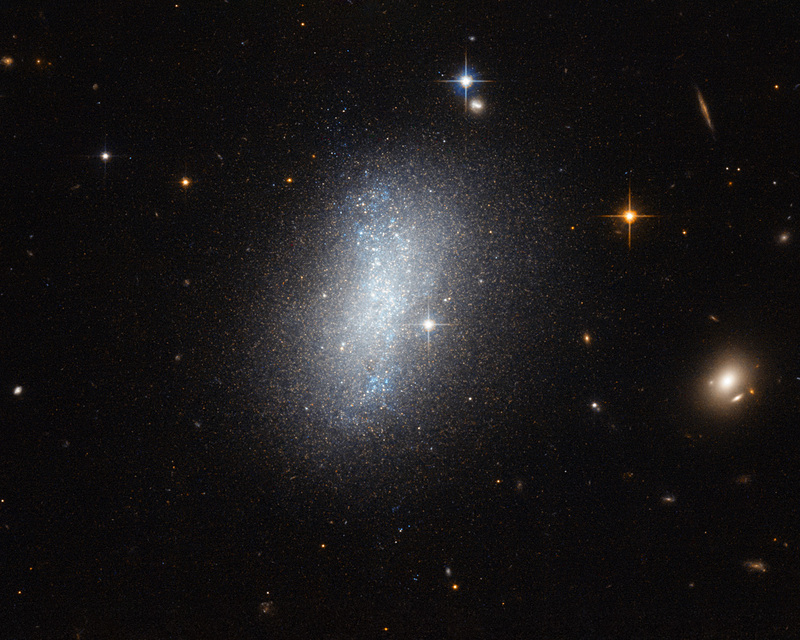 The subject of this new NASA/ESA Hubble Space Telescope image, a beautiful dwarf irregular galaxy known as PGC 18431, is one of these galaxies. This image shows PGC 18431 smudged across the sky, but it wasn’t imaged purely for its looks. These Hubble observations were gathered in order to probe how Local Volume galaxies cluster together and move around. 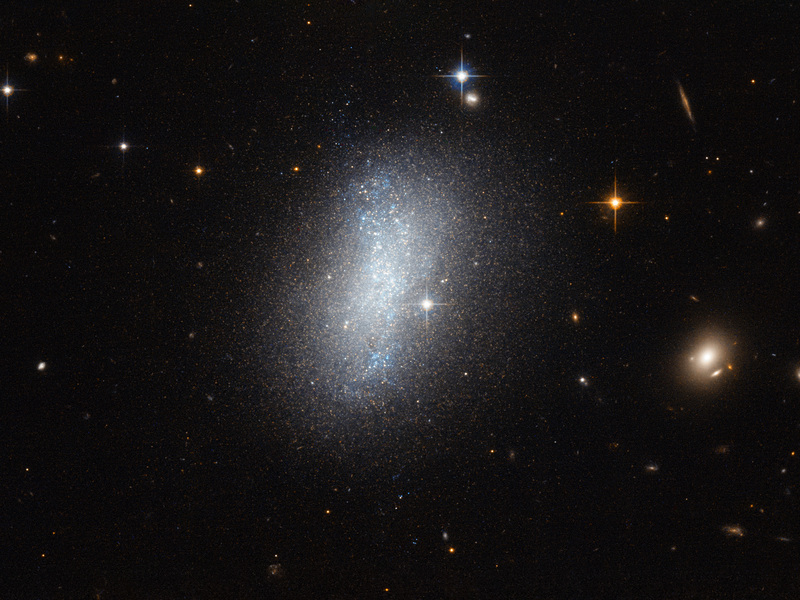 Hubble’s high resolution allows astronomers to explore star populations within these moderately distant galaxies — specifically, stars known as tip of the red-giant branch stars — in order to get an idea of the galaxy’s composition and, crucially, its distance from us. Knowing galactic distances enables us to accurately map a galaxy sample in three dimensions, a method key to understanding more about our cosmic neighbours, and to dismiss perspective and line-of-sight illusions. Position (Dec): -34° 12' 8.78"